When you choose a senior insurance discount (or "mature driver") course, you should choose one that is approved by the State of Florida. Why is this important? 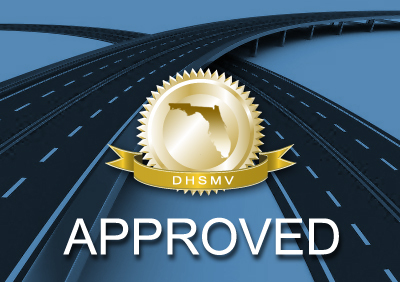 Because Florida law only authorizes auto insurance premium discounts for drivers who take a 6-hour mature driver course that is approved by the Florida Department of Highway Safety and Motor Vehicles (DHSMV). You can sign up for the DHSMV approved mature driver course by clicking the register button on this page. Don't risk not getting your insurance discount because you took a course that wasn't DHSMV approved! "Your mature driver course helped me get a much needed discount on the insurance for my truck." The law that authorizes Florida insurance companies to give senior drivers an auto insurance premium discount is found in §627.0652, F.S., which is printed below. (1) Any rates, rating schedules, or rating manuals for the liability, personal injury protection, and collision coverages of a motor vehicle insurance policy filed with the office shall provide for an appropriate reduction in premium charges as to such coverages when the principal operator on the covered vehicle is an insured 55 years of age or older who has successfully completed a motor vehicle accident prevention course approved by the Department of Highway Safety and Motor Vehicles. Any discount used by an insurer is presumed to be appropriate unless credible data demonstrates otherwise. (b) Not be convicted of or plead guilty or nolo contendere to a moving traffic violation. (3) The Department of Highway Safety and Motor Vehicles shall approve motor vehicle accident prevention courses for the purposes of this section. The Department of Highway Safety and Motor Vehicles shall consider the competency of the personnel offering the course, the quality of the content and activities of the course with respect to its capability to prevent accidents by persons age 55 or older who complete the course, and the reasonableness of the fee for the course. The Department of Highway Safety and Motor Vehicles shall establish the minimum number of hours necessary for completion of a course. A course approved by the Department of Highway Safety and Motor Vehicles shall require each person completing the course to pass a written test given by the course evaluating the person�s knowledge of the content of the course. (4) The organization offering the course shall, upon a person�s successful completion of the course, issue the person a certificate that the person may use to qualify for the premium discount required by this section. (5) This section does not apply if the approved course is taken as punishment specified by a court or other governmental entity resulting from a moving traffic violation. There is a brief final exam that you must pass in order to receive your certificate of completion. Your completion certificate will be sent to you by the method you selected when you registered for the course. Once you receive your certificate, we recommend that you make a copy of it for your records. Sign the original certificate and turn it in to your insurance provider according to the instructions you have been given by your insurance agent.